The Kids Made Me Fat: No My Pet Didn't Die. I Got A Hair Cut. No My Pet Didn't Die. I Got A Hair Cut. Everyone tells me not to do it but I never listen. My friends politely try to talk me out of it. My husband just flat out calls me crazy, but I do it anyways. Every two years or so, I walk into the salon and have them lop off all of my hair. 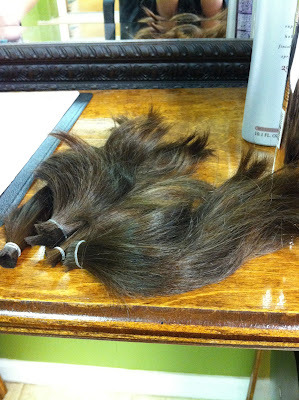 This time I had nine inches cut off. On the bright side, my hair was donated and will be made into a wig for someone with cancer. However, I now look like a mushroom. Stupid fungus. I look like a fungus. The stylist did a great job. She did exactly what I asked for. I love her and the salon. The problem is my hair or perhaps my lack of styling finesse. It looked cute in the shop. It looked cute when she did it. However, when left to my own devices, I have myself looking like a damn Chia Pet. Sobbing to my friends on the phone leaves them alarmed - "What Abbie? What? What happened to your pet?" This happens everytime I cut my hair. So why? Why do I keep doing it? I guess I'm just hopeful. Hopeful that one day I'll get it right. 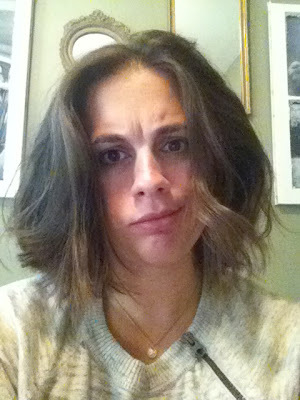 Hopeful that one day my haircut will be great or at the very least steer clear of the fungi-family. Cha-Cha-Cha Chia. Hmm - Maybe I should try bangs. Bangs are ALWAYS such a good idea. aaawww!!! i think it looks very nice, im planning on cutting my hair also probably about the same length as u my hair is super long and i have a 3 month old baby who loves to play with it!!!! its so much easier to maintain when its short I LOVE IT!